I like the idea of giving these cites their own dedicated threads where we can keep track of development. To start this one of, thought I'd share what I consider a rather impressive development in downtown St Cloud. If they pull this off, the image of St. Cloud could start to change. St. Cloud partnered with ADMC to renovate the historic Hunter Arms Hotel and St. Cloud hotel. Perhaps most impressive, the development also calls for a 15 story modern highrise with "luxury" apartments, a rooftop restaurant, ground floor retail, and a 250 space parking garage. 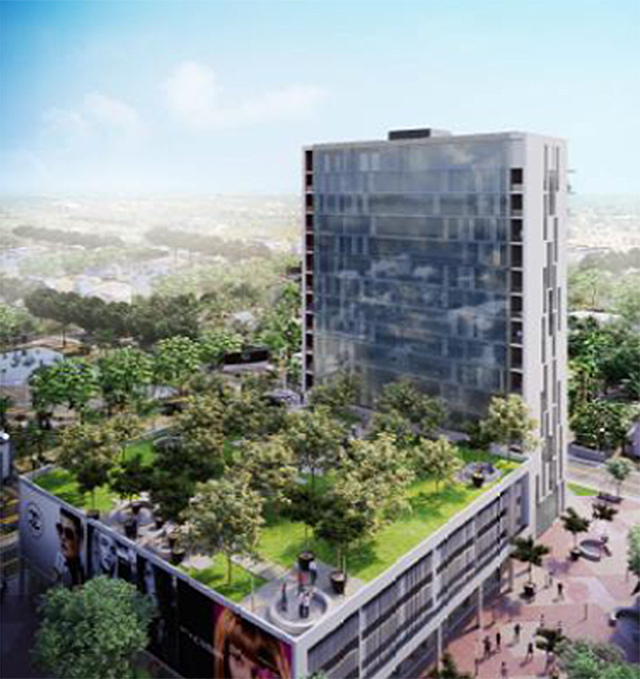 Rendering of the St Cloud Hotel and the proposed apartment tower. What ever they do to Hunter Arms they should have a plaque that says "2,000 Maniacs filmed here in 1964". We don't want to lose important history like that. does this border lake nona area at all? Kissimmee celebrated the ribbon cutting on their new downtown parking garage that will provide parking for the SunRail station as well as downtown. This is currently the only free structured parking available along the commuter rail line. I have this underlying feeling that the southern extension of Sunrail is going bring a huge boost in ridership. Driving from south of Orlando into Downtown is much more difficult than driving from the north. The highways make less sense in their placement, and the big city down there will have a nice centralized station as opposed to Sanford and Deland (or is it Debary right now?). It will undoubtedly be a huge boost. The geography didn't really support SunRail phase I though it's good it was there in case I-4 construction ended up being horrible. Now it will be a no brainer from Kissimmee to points north and from Orlando/Seminole down to IMEC/Neocity as that project gets off the ground. The southern extension is also an important part of a holistic approach to transit. SunRail's disappointing numbers will be ancient history so long as the region and its people stay committed to it. I worry that people have already bailed on it. I didn't see Sunrail Phase 2 North or Phase 3 on the Federal Infrastructure wish list for FL, but I-4 Beyond the Ultimate, Brightline, and the Airport Expansion are all there. Everytime I talk to people about Sunrail, they already write it off as a joke and I'm afraid the image is done. That said. I used to feel the same way. The southern connector will be the boom for it. How do you get to Poincianna or Kissimmee in under an hour? You'd have to be lucky and have I-4 and the Turnpike both clear. Is I-4 Beyond the Ultimate even necessary? The only part I see that a renovation is needed is south from Universal to Disney and maybe just the bridge over that one lake in the north. I think the airport connection is more needed and much more likely to go forward than Phase 2 North. The amount of money needed to extend the line by one station does not constitute the benefits to ridership gained once completed. As has been mentioned in other threads, I believe a link westward to West Orange cities (WG, Clermont, etc) would be better bang for the buck than continuing north. When you think about where stations are successful, it tends to favor already established (or establishing) urban areas such as downtown and Winter Park. As has been mentioned in the WG thread, there is a certain urban feel and nature to WG that would lend itself nicely to rail and ridership that really doesn't exist at a park n ride station in Deland. Back to Kissimmee, I agree with all the points that this will be a boon to overall ridership. The good folks in Poinciana, in particular, have such few options (even with the new expressway) for moving to points north, that this train will actually be a convenient and stress free option. Project Description: Mosaic was selected to redevelop 11 acres of vital land in downtown Kissimmee, directly across from Lake Toho and the City’s Waterfront Park, which was just part of a $34M upgrade that also included streetscape and utility enhancements. The site is 2 blocks from a multimodal station, which currently has Amtrak service and will have SunRail service in 2017. The project includes 260 apartment units (studio, 1 and 2 bedroom luxury apartments), 16 for-sale townhomes at 1,800-2,000 SF with roof top terraces, 21 flats, 15,000 SF of commercial space and a 120 key hotel. To accommodate downtown visitors, the City is building a 400 space parking garage that will be shared with the project. Hotel level amenities will be incorporated into the apartment community and the hotel and apartment users will have access to the new Lake Toho marina. The Florida Vernacular architectural style was selected in coordination with City staff and is sensitive to and complements the existing architectural fabric of the community. Construction is expected to start mid to late 2017 after the relocation of an existing electrical distribution facility and final clean-up of a remaining parcel. I'm more familiar with north of Orlando (Altamonte Springs, Sanford, DeLand) than the south, and from my experience I say this: I-4 beyond the Ultimate will at minimum have to be extended up to the St. Johns River/Lake Monroe bridge, if that's the lake you're thinking about. The traffic that comes to/from the north, particularly from the sprawling mess of Deltona, is pretty bad, and Sunrail doesn't go, and is no longer planned (funded) to go there, which is a shame. I'd say toll lanes can maybe go as far north as Saxon or Howland Blvd. To the south, I'd imagine "Beyond the Ultimate" would go all the way to the 429 intersection, I'd imagine they do direct connect ramps from I-4 toll lanes to the 417 and the 429 down there. Beyond that, I don't see it as necessary. But I agree, the airport link is the most critical thing after Phase 2 is completed. Sunrail going further north might not happen for years. And the residents of Volusia County don't appear to be willing to pay for a DeLand station. My understanding is another issue with the north extension is there also is some desire to eventually extend Sunrail all the way to Daytona Beach, and that may effect the northern extension as well. Ya see, I don't get this idea at all and simply cannot take it seriously. Sunrail is a commuter rail line. Its purpose is not to take people to the cost because there is a very small amount of people who commute to anywhere in greater Orlando from Daytona Beach. Sunrail is not an intercity rail system. Here's the rendering presented to City of St Cloud of the rooftop park on top of the parking garage. Mark, thanks for sharing. This is really a transformative development should it move forward. It was started as a commuter rail line. This seems to have been politically-based in nature. I think that SunRail ultimately will really succeed when it evolves to a fully functional train system. I've said this elsewhere, but even the greatest city rail systems in the world (NY Subway, London Underground, Paris Metro, etc. etc.) took a LONG LONG time to get up and running. It's great to look back 100+ years later and go "BUT IT'S A HUGE SYSTEM!" but some of them were just 1 or 2 lines for 20+ years. It took like 35 years for the NY Subway to go from above ground to underground. Something that is almost impossible, extremely unlikely, and basically unnecessary in our climate. However, these things take a lot of time to get off the ground. The great thing about Kissimmee is that they seem to be fully embracing this. The support for SunRail seems to be massive there. All signs point to Kissimmee and Poinciana being huge boosters to this whole project. I know people in both cities who are really excited for it. There's no track currently going to Daytona on CFRC lines and trying to acquire a dedicated R/W is likely cost prohibitive. Best case scenario you use mostly US 92 as your R/W through Tiger Bay and maybe follow LPGA Blvd to Daytona? That still puts you away from everywhere you want to be in Daytona. I'm sorry for continuing to pull away from Kissimmee/St. Cloud/Celebration in this thread. Yeah. They were talking about somehow coming out of the DeLand (unbuilt) station and heading East on some semi-abandoned spur???? Then somehow magically getting over to I-4 and using the I-4 median to get to 92???? I'm guessing it would have to final stop somewhere about the Speedway or something??? It was all pretty vague and included a lot of fairy tale wishes. However, it would be epic to take the train to the beach or the Speedway if you lived somewhere like Poinciana or Kissimmee. I think I actually see the spur. It ends at about Michigan/N. Clara in DeLand. Looks like a bike trail (former rail????) goes about a mile further and dead ends at a church. That is still a solid 4 or 5 miles through a fully populated area to get to I-4. Gaining a 100% on Rotten Tomatoes and debuting at Cannes Film Festival, the film "The Florida Project" dramatizes life for a poor mother and daughter living in Kissimmee on 192 according to USA Today. Perhaps it will bring attention to actual poor people who are living in those 192 hotels with no power or water. Willam Defoe and an actress discovered on Instagram play the leads. Another description of the film says "tells the story of a group of young kids whose summer break is filled with childhood wonder while their parents and the adults around them struggle with hard times." A company called A24 beat out Amazon to get the North American distribution rights. The Neo City development is moving forward in Kissimee. Perkins+Will developed the master plan which has been approved by the city. This master plan is designed to provide an urban framework for future development of office, commercial and residential space in the area that surrounds the advanced manufacturing facility that opened earlier this year. It is expected to attract other high tech companies. The area is surrounded by Osceola Heritage Park/192 to the North, and Lake Toho/downtown Kissimmee to the south. Emphasis has been placed on creating connections to existing neighborhoods and enhancing the trail network. There's a station in Sanford and DeBary. They're supposed to build a station in DeLand in Phase 2, but I'm not sure if they're still gonna build it. Honestly, Kissimmee is killing it. If I was 10 years younger and didn't yet have a wife and kids I'd buy down there yesterday. Outside of housing regional venues, I really think they've got downtown Orlando beat. I think it's too soon to say where it's all heading, but I do think that it's incredibly encouraging that Kissimmee gave up on central Florida about ten years ago and forged a forward path. It always seemed to me as if the metro was compliciant in making Kissimmee the armpit of the region and turning a blind eye, when in reality some of the strongest bones, economically and politically, remain there. Neo City didn't appear out of the dust. Those who believe in the betterment of the city labored for a decade over it.